A New York City doctor who recently returned from treating Ebola patients in Guinea tested positive for the disease on Thursday. Dr. Craig Spencer, 33, reported a fever of 100.3 degrees and gastrointestinal problems Thursday morning, both symptoms of Ebola. He was then transported to Bellevue Hospital in an ambulance staffed by a "specially trained HAZ TAC unit wearing Personal Protective Equipment," according to a statement from the New York City Department of Health and Mental Hygiene. Tests conducted at the hospital revealed that he had the virus. 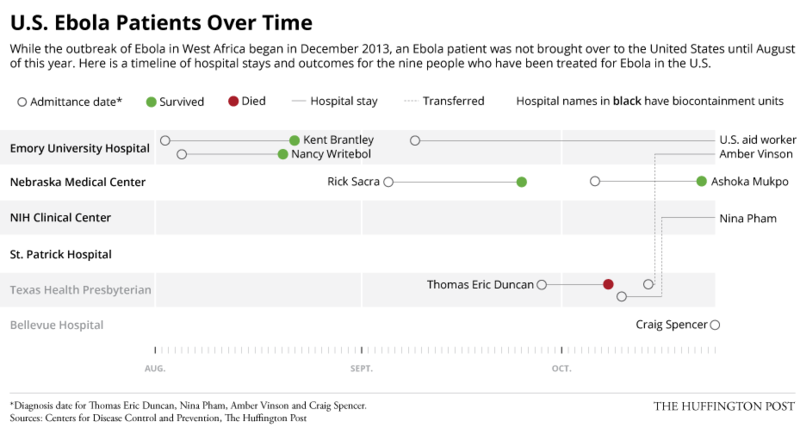 Spencer is the only case of Ebola in the city of more than 8 million. He is now the fourth person to be diagnosed in the U.S. with the viral disease. "There is no reason for New Yorkers to be alarmed," NYC Mayor Bill de Blasio said at an evening press conference. "New Yorkers who have not been exposed to an infected person's bodily fluids are not at all at risk." Sharing a subway car or living near someone with Ebola does not transmit the disease, de Blasio added. "We are as ready as one could be for this circumstance," added Gov. Andrew Cuomo during the press conference. "What happened in Dallas was unfortunately the exact opposite -- we had the advantage of learning from the Dallas experience." President Barack Obama spoke with de Blasio and Cuomo on Thursday night and offered full federal support in response to the first Ebola case in New York City, the Associated Press reported. The CDC also dispatched an Ebola response team to conduct further tests on Spencer and assist the city's response. Spencer left Guinea on Oct. 14 via Europe and arrived in New York on Oct. 17, said NYC health commissioner Dr. Mary Travis Bassett during the press conference. Upon arrival, he had no symptoms, but he checked his temperature twice a day as a precaution. On Oct. 21, Spencer began feeling tired. Still, he managed to go on a 3-mile jog (a sign he was "feeling quite well," said Bassett) the next day, on Wednesday. Also on Wednesday, Spencer took subway trains A, 1 and L, visited the High Line park, a restaurant and then a bowling alley called The Gutter in Williamsburg, Brooklyn. After it was confirmed on Thursday night that Spencer had visited the bowling alley, the venue was shut down and a concert scheduled there as part of the CMJ music festival was canceled, Brooklyn Vegan reported. Officials have been retracing Spencer's steps and interactions to determine if others may have been exposed. Ebola is only transmittable when the carrier of the virus is experiencing symptoms. Three people Spencer had contact with since returning to the U.S. were to be quarantined and monitored. None were yet showing symptoms of Ebola. Of the three, one is in isolation in the hospital, said Bassett. CNN reports that this person is Spencer's fiancee, who was identified as Morgan Dixon by The New York Times. A person briefed on the investigation said that it was unclear whether the other two contacts would isolate themselves in their homes or if they would be relocated by authorities, the Times reported. The Manhattan apartment that Spencer shared with his fiancee was also quarantined. An Uber driver who transported Spencer on Wednesday night is not considered at risk because he did not have direct contact with the doctor, said Bassett. In a statement, Uber confirmed that public health officials personally met with the driver in question to say Spencer posed no risk to anyone in the car, nor subsequent passengers. Spencer also told officials that he was in full protective gear during his time treating patients in Guinea, and is aware of no breach in safety protocols. The physician is a dedicated humanitarian on the staff of NewYork-Presbyterian/Columbia University Medical Center who went to an area of medical crisis to help a desperately underserved population. He is a committed and responsible physician who always puts his patients first. He has not been to work at our hospital and has not seen any patients at our hospital since his return from overseas. Our thoughts are with him, and we wish him all the best at this time. Earlier today, a spokesperson for Doctors Without Borders confirmed in an email to The Huffington Post that someone working with the organization had developed Ebola-like symptoms, but declined to confirm Spencer's name. The organization immediately reported the information to the city Department of Health and Mental Hygiene. Doctors Without Borders' policy is that all staff self-monitor their health daily after returning home from working with Ebola patients. Bellevue Hospital is one of eight designated facilities for the isolation, diagnosis and treatment of Ebola patients in New York. It has four single-bed rooms that are capable of receiving confirmed Ebola cases. The area, which is located in the hospital's infectious disease ward, also has an onsite laboratory for handling Ebola samples, according to a statement released on Oct. 15. UPDATE: A previous version of this article, relying on preliminary reports, stated that Spencer had a 103-degree fever on Thursday. The fever was 100.3 degrees. CORRECTION: A previous version of this article stated that Spencer jogged on Tuesday, but he in fact jogged on Wednesday. We regret the error.